American Editor: John Gustav Delly, Scientific Advisor to Hooke College of Applied Sciences, Westmont, Illinois, U.S.A.
FREE downloadable 532-page book in PDF format. 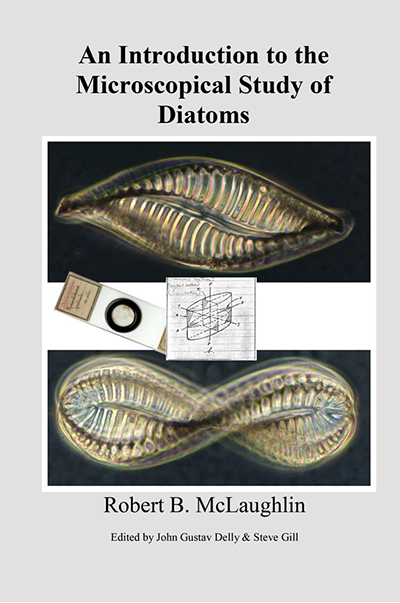 This extensive work describes the work of the late Robert B. McLaughlin on his diatom studies carried out over a number of years. He always intended to publish this work but his untimely death left it still in draft form. However, some publishers had shown great interest in his work but, with his death, sadly no further progress was made. John Gustav Delly and Steve Gill have now taken it upon themselves to edit and publish this work and also provide a biography of the late McLaughlin himself, a fascinating polymath. They’ve done this as a simple PDF document. The result is very successful since it is sympathetic to the manner in which many of us now work, aided with a simple PC and far less need to constantly revert to the library for reference. The work is an ideal vade mecum for the amateur diatomist. Firstly, general textbooks on the Diatomaceae have always been prohibitively expensive and frequently quite difficult to obtain. This publication is very useful for current amateurs working in the field and will certainly introduce newcomers in a simple and far less tedious way than heretofore. It covers everything from collection, biology and all the details of slide preparation, as well as descriptions of the apparatus and necessary chemical reagents required. For a beginner this article alone would provide sufficient information for him to commence diatom research virtually at once and save him many hours of tedious searching through a wide variety of textbooks difficult to find and, more frequently than not, in German. I would recommend anyone interested in making diatoms a hobby, that they could do no better than starting with this article. This ‘book’ is published in electronic form, as a PDF file. Those that cannot cope with the necessary on-screen reading can print it out if they deem this essential. Whilst reading this terrific resource, it reminded me of when I first became interested in diatoms myself. This was in the mid 1990s, and like often happens with such things, I went through that period where I couldn’t get enough information surrounding these fascinating organisms, their collecting, cleaning and subsequent slide-making. If only there had been a resource like this. It is in many ways a complete guide. It covers just about everything for the budding and more advanced microscopist interested in diatoms. The biology is covered in great detail, covering structure and morphology, physiology and the inevitable section on classification. Breaking the text up for the reader, the whole thing is interspersed with small boxes to clarify terminology used and many original line drawings and diagrams done by the author himself. These do add a certain something and are evidence of what a student of diatoms he was, keeping meticulous notes throughout his interest. The section on the uses of diatoms is fascinating, covering as it does scientific uses in addition to the more well-known commercial ones. Going back to my own early interest in the group, I used to visit the main library in Birmingham when I could, where they took the McCrone publication ‘The Microscope‘ and I would be able to read some past issues. Much of it was either beyond me, or of no interest, but I often ended up taking copies of the column done by the author entitled ‘Diatom Notes’. These often included examples of where diatoms had helped solve a forensic case and as such I found a really good read. For most readers, by far the most useful section will most likely be the chapters on cleaning and mounting, since having obtained a sample that is what we most want to do next, and this is where experience helps. Around a dozen mountants are discussed at length, including practical details of how to make Styrax from the much more widely available storax. There is much more practical detail on using the more popular mountants in the very descriptive and therefore useful sections on mountings itself. Included in this is a discussion of slips and covers that leaves little to chance. Adhesives to fix the diatoms are discussed at length, the use of spacers for some specimens and the ringing process. Again, rather than specify one cement type, several are suggested, so that most modern workers should be able to obtain something suitable or indeed use an existing cement. Type slides are also discussed at great length. This should dispel the idea that this book is just for beginners! All the above is in part I, some 194 pages. Part II deals with Collection and Preparation methods. All sorts of collection methods are discussed, including in marine, freshwater, brackish and fossil habitats. Where equipments such as nets is suggested, details of making and using these are covered, with hand-drawn diagrams to help explain. Killing and fixing and staining are all covered, the latter going into detail of how to stain particular cellular components. A particularly comprehensive section, usefully for the amateur worker, is that on cleaning methods. Again the coverage is most practical, and reasons given for following a given methodology, which is a refreshing alternative to the situation often found, where one method only is offered. There follows a chapter on washing, separation and storage, which will hopefully benefit diatomists of the future, if we want our samples to live on. Part III is entitled ‘Study methods’. The first part of this is an introduction to literature, and I think this is a useful inclusion, particularly for those not familiar with referencing. The remainder of this large section is almost a bonus, as it is a full discussion of instrumentation and microscopical techniques. The coverage would be sufficient if this was a book on microscopy, as it is quite comprehensive, but of course the slant is towards instruments and techniques beneficial for working with diatoms.Various illumination techniques are covered. The section on drawing is especially useful, and reflects the fact that the author quite clearly put this to good effect on a regular basis, and I would recommend this to anyone who wishes to make drawings of what they see down the microscope, diatoms or not. Whilst the section that follows this, on photomicrography of diatoms, is a little dated in the light of digital cameras being the norm now, the principles are of course still relevant. To finish off part III is a comprehensive discussion of quanitative methods of measurements, namely counting, length and mass measurements etc. The volume has two appendices. The first is a bibliography for publications by the author, and the second one for all other references given in the text. As displayed in the pdf this publication amounts to just over 500 A4 pages. It is a terrific resource for anybody interested in looking at, sampling, preparing and studying diatoms. There is so much information here that sometimes the order that topics are dealt with can seem odd, but this is a very minor criticism. I fully recommend this book, and would dearly like to have a printed copy to hand, but this electronic form at least makes this information, and most important the experience of the author, available to me, for which I thank the editors. The book is also available online, downloadable (27MB) for free at The Amateur Diatomist.